Aspartic proteinases have been extensively characterized in land plants but up to now no evidences for their presence in green algae group have yet been reported in literature. Here we report on the identification of the first (and only) typical aspartic proteinase from Chlamydomonas reinhardtii. This enzyme, named chlapsin, was shown to maintain the primary structure organization of typical plant aspartic proteinases but comprising distinct features, such as similar catalytic motifs DTG/DTG resembling those from animal and microbial counterparts, and an unprecedentedly longer plant specific insert domain with an extra segment of 80 amino acids, rich in alanine residues. 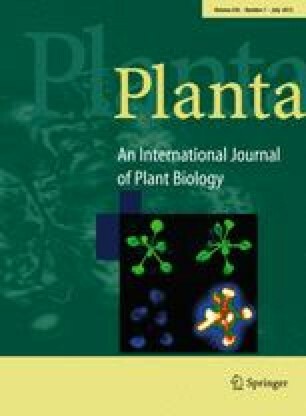 Our results also demonstrated that chlapsin accumulates in Chlamydomonas chloroplast bringing this new enzyme to a level of uniqueness among typical plant aspartic proteinases. Chlapsin was successfully expressed in Escherichia coli and it displayed the characteristic enzymatic properties of typical aspartic proteinases, like optimum activity at acidic pH and complete inhibition by pepstatin A. Another difference to plant aspartic proteinases emerged as chlapsin was produced in an active form without its putative prosegment domain. Moreover, recombinant chlapsin showed a restricted enzymatic specificity and a proteolytic activity influenced by the presence of redox agents and nucleotides, further differentiating it from typical plant aspartic proteinases and anticipating a more specialized/regulated function for this Chlamydomonas enzyme. Taken together, our results revealed a pattern of complexity for typical plant aspartic proteinases in what concerns sequence features, localization and biochemical properties, raising new questions on the evolution and function of this vast group of plant enzymes.